At 2015 CinemaCon, Walt Disney Studios unveiled a handy new chart highlighting their upcoming release schedule for 2015 to 2017. ComicBook.com was on-hand at the panel to capture the image above. 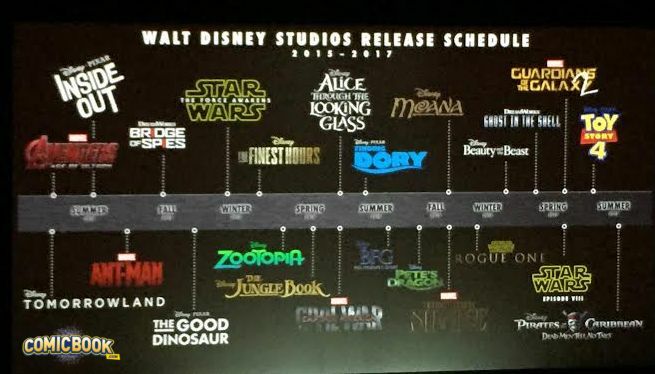 While the chart didn't contain any big surprises, it's a great reminder at just how strong Disney's upcoming release schedule is. It's also a great look at all the logos for Disney's upcoming films in one place. 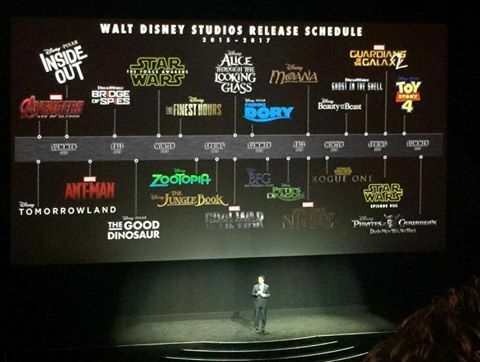 The schedule includes numerous franchise properties from Marvel Studios, Lucasfilm, Dreamworks, and Pixar. Marvel Studios films include Avengers: Age of Ultron, Ant-Man, Captain America: Civil War, Guardians of the Galaxy 2, and Doctor Strange.